Three asylum seekers, who fled war-torn Syria, made their way to Britain without passports and were later arrested, have been told they were ill-advised when they arrived in the UK and so they can appeal their convictions. The men in question landed at Heathrow Airport at various points throughout 2013, claiming they were threatened in Syria. But because they were not in possession of travel documents required under UK law they were arrested. Following advice they should plead guilty, they were imprisoned for between two and four months. Upon reflection, Britain’s Criminal Cases Review Commission (CCRC) said the men had been wrongly advised and have been permitted an appeal. Since 2012, Britain’s criminal justice system has presided over the conviction of 34 asylum seekers. A total of twenty-six people from foreign states have had similar convictions overturned, according to the CCRC. The most recent cases, however, are the first to involve Syrians. The CCRC told the BBC on Thursday the first of the three Syrians, then aged 19, landed at Heathrow in July 2013. He informed an immigration officer he did not have a passport, but wished to apply for asylum in Britain. The young man, who is now 21, said he fled Syria in the wake of death threats and got to Britain via neighboring Lebanon and Egypt. Despite his complex case, the man was arrested and sentenced to four months imprisonment in a jail for young offenders. The second man landed in the UK in August 2013. He said he had fled from Syria the previous month because of the war and a number of verbal threats he had received. He was also arrested and subsequently sentenced to 8 weeks in jail. A third Syrian man arrived in November 2013 without a passport. He told UK officials the Syrian government suspected him of being a member of the Free Syrian Army. He was sentenced to three months. Following legal advice, the men pleaded guilty and were sentenced at Uxbridge Magistrates Court in south East England. The CCRC, which investigates suspected miscarriages of justice in the UK, said the asylum seekers were ill-advised by British legal aid lawyers, and that they had had no access to a proper defense. The conflict in Syria began in March 2011. Four years later, the war-torn state’s social, political and humanitarian crises continue to escalate. At present, millions are ensnared in dire conditions lacking the most basic necessities for survival. Since the conflict broke out, over 190,000 Syrians have been killed while 1.5 million have suffered injury. Two million houses have also been destroyed or damaged, and many hospitals and schools have been closed or made inaccessible. 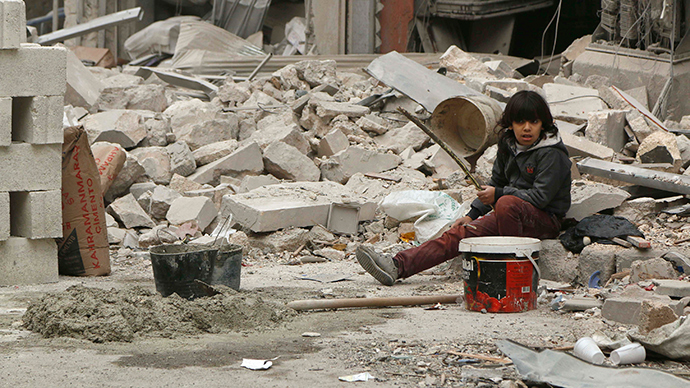 An estimated 12.2 million Syrians currently require humanitarian assistance, 5 million of whom are children. The scale of destruction plaguing Syria has been described by the UN as the world’s most serious crisis since World War II. Despite the worsening humanitarian situation there, the British government has not been forthcoming in opening Britain’s doors to Syrian refugees. As a result, the Liberal Democrat-Conservative coalition has been sharply criticized by prominent human rights groups and celebrities in Britain. In January, a group of British celebrities wrote a strongly-worded open letter to Prime Minister David Cameron denouncing Britain’s resettlement program for Syrian refugees, warning it lacks scale, compassion and humanity. The program was founded early in 2014, following persistent pressure by human rights campaigners. Over the next three years, the government is expected to resettle several hundred Syrians in the UK as part of the scheme. However, this contrasts sharply with UN recommendations, which suggest governments worldwide should offer 130,000 resettlement places to Syrian refugees in the next twelve months. Writing to the government, the signatories said the British government is failing in its duty to assist Syrians who face horrific conditions in the Middle East. Maurice Wren, chief executive of the Refugee Council, said at the time the government’s inadequate resettlement program risks blackening its foreign policy legacy in years to come.